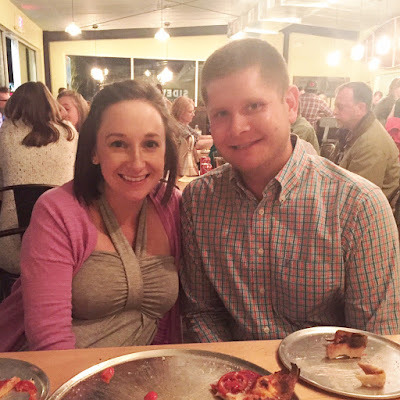 This weekend was one of the last completely free weekends that T and I will have until we're on baby watch in May. We took advantage of our free weekend to catch up on some home projects and spend time with friends. Friday night we took it easy, ordered wings from a place nearby, and caught up on some episodes of The People v O.J. Simpson we'd DVR'd. On Saturday we worked on a few things for the nursery and did some yard work. We also picked up some new windows for our den that we're going to try to install ourselves. Well, let's be real here... I'm probably going to just observe the process. Our house still has all the original windows from the early 90's, so little by little we hope to replace them all. Our den is the one room that needs the most work in the house, so we're starting there. Replacing the windows in that room will be the catalyst for a full room redo. Once the windows are in, we'll paint, get some new furniture, and give that room some love after over 6 months of neglect. I am so ready for the burgundy accent wall to be gone. I HATE it. Here are a few peeks of nursery progress that we've made. If you follow me on Snapchat (@thereedyreview), you may have already seen some of these. 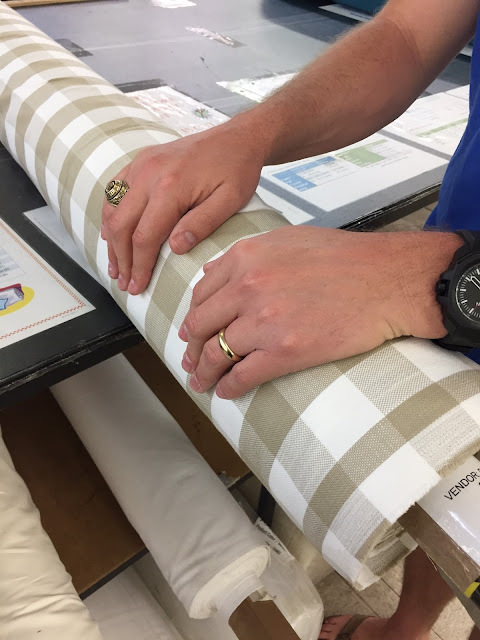 A few weeks ago on the way home from Charlotte T and I stopped by Mary Jo's to find some fabric for curtains and a crib skirt. I fell in love with this tan and white buffalo check, so we purchased enough to make the curtains and crib skirt. The crib skirt came together really quickly. I wanted it to be adjustable so that it always touched the floor no matter how high or low the mattress was. In the photo, the mattress had been lowered all the way for my niece Camille, but we'll raise it all the way back up for Thompson. I used this tutorial to put it together, and made all three panels in less than 2 hours. You can also see another new addition to the room, this Melissa and Doug stuffed giraffe. I'm still trying to figure out the best placement for it, our nursery is tiny, so a 4.5' tall giraffe definitely has a presence in there. Since the room is so small, I really struggled with finding a bookshelf to work in the space. 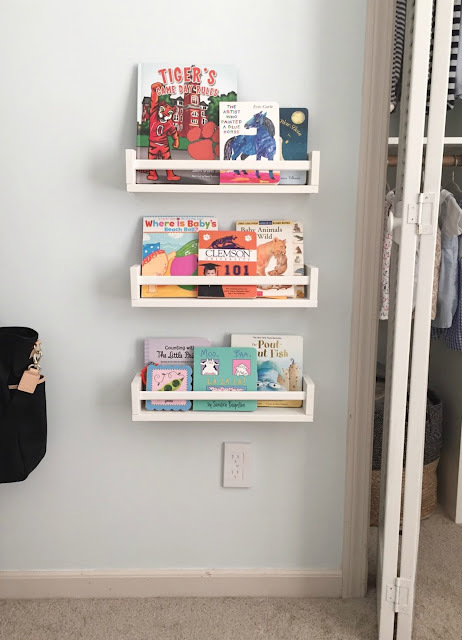 The crib, glider, and dresser/changing table take up almost all of the wall space, so there really wasn't any other place for a bookshelf. When we were at Ikea recently T and I picked up 4 Bekvam Spice Racks that we planned to use for storing books. George found them and ate one (ugh! ), but I painted the remaining three white and they make the perfect little bookshelves. We may eventually add one more, but it's not worth making a special trip to Ikea just for that. If you don't have an Ikea nearby you can also purchase them for a little bit more through Amazon Prime here. I also finished chalk painting the dresser/changing table. You can see in the crib picture above that it was a darker gray to begin with. I went over it with a lighter shade of gray, Annie Sloan's Paris Gray, and ordered some new pulls for it. I'm hoping T can apply the wax one evening this week (that's the one part I'm not supposed to do) so that it will finally be finished. After that all of the big things will be done, we'll just need to get some things hung on the wall. I've really been dragging my feet with that, I just can't seem to find anything that I love enough to hang! If you have any suggestions, I'd love to hear them! I think we'll do some sort of gallery wall either over the changing table or above the glider. And lastly, I put together the curtains, but they still need to be hemmed. When we were at Mary Jo's I picked up 75% blackout fabric to line the curtains with, and used this tutorial to put them together. We still need to hang the curtain rod, but once that's up, I can hem them so that they'll be complete. And that's about it on the nursery. I'm also hoping to get new windows installed in that room before baby's arrival, and we'll get new blinds at that point, too. Right now there are old nasty aluminum ones, so I'm ready to get those out of there. 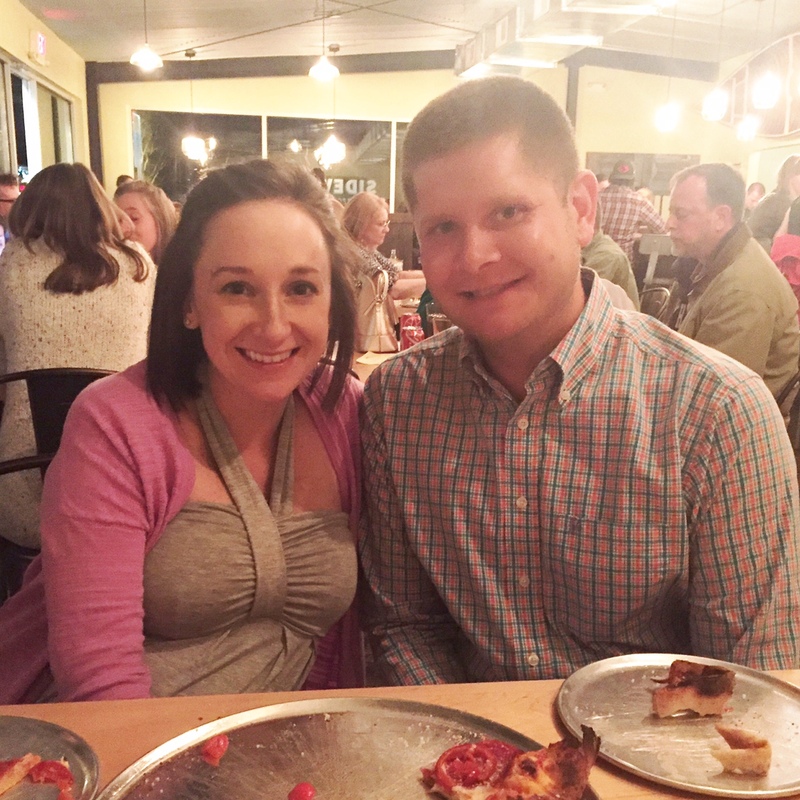 After a day chock-full of projects , T and I treated ourselves to dinner out with friends at Sidewall Pizza Saturday night. It's been almost a year since we've been there, and I forgot how much I love that place. They're opening their downtown location this week, and I can't wait to try it out soon! 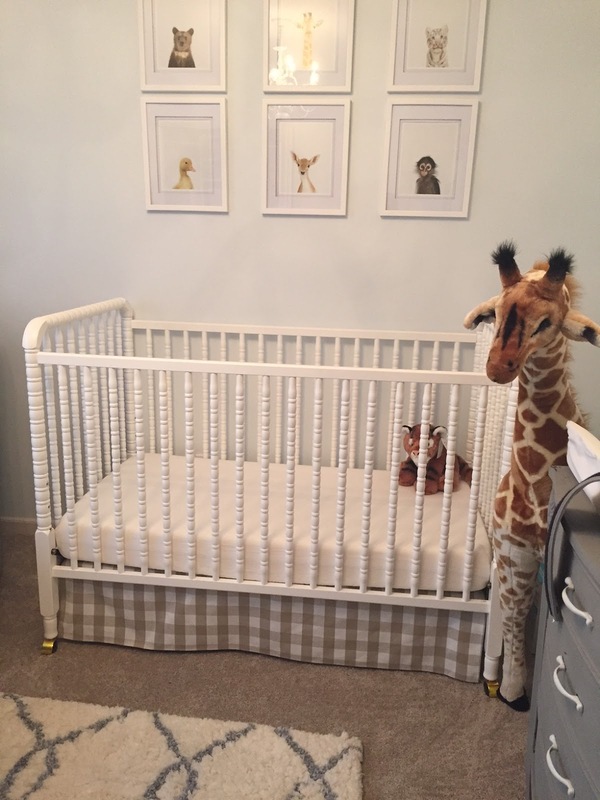 The nursery looks great- love the prints above the crib! I am impressed you made that skirt so quickly! We love Sidweall, I didnt realize the one downtown would be open so soon! Your crib and curtain fabric is perfect! I found myself wondering if I should diy the crib skirt as well. It's too bad we aren't closer to each other since we are working on these same projects, ha! The nursery looks great. I love the crib skirt!